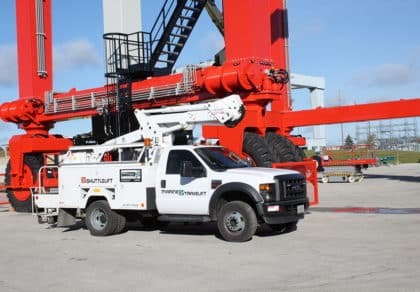 STURGEON BAY, WI – The team at Shuttlelift in Sturgeon Bay, Wisconsin, has addressed a growing need for a mobile gantry crane to lifts loads approaching 100-ton U.S. plus the weight of a spreader. 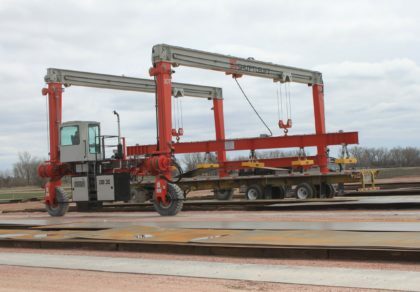 The team has developed its first DB 110 double-beam mobile gantry crane with a lifting capacity of 110 US tons, and, this new crane model immediately met the unique needs of an East Coast precast/prestressed concrete company. 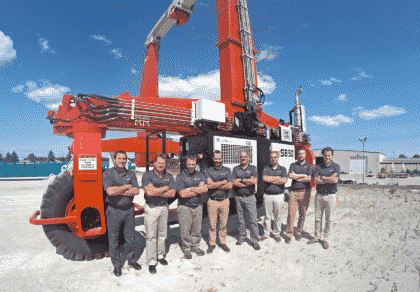 The new crane was delivered in mid-June to Unistress Corporation in Pittsfield, Massachusetts. 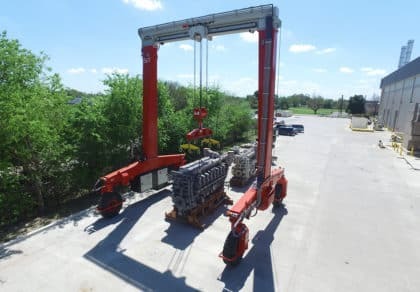 Unistress already has two 50-ton Shuttlelift cranes, and they purchased a new 70-ton machine just nine months ago. 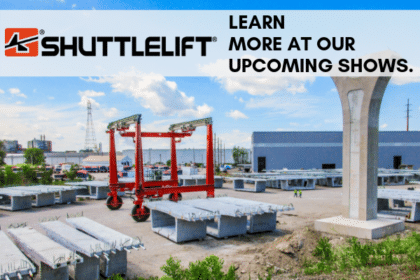 Unistress communicated with Shuttlelift that the company needed greater capacity to accommodate two new bridge projects and were very happy with their previous Shuttlelift purchases. 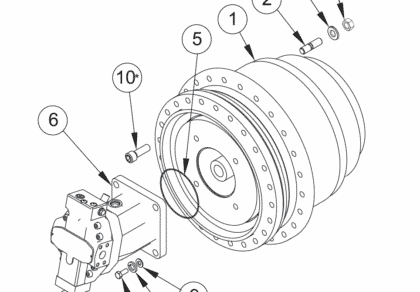 Not only was the Shuttlelift team requested to meet specific Unistress parameters for the DB 110, timing was also critical. 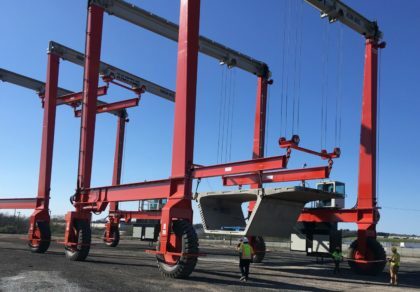 Bridge work involves what are known as “penalty contracts.” That means if the work is completed early, the corporation receives a bonus. 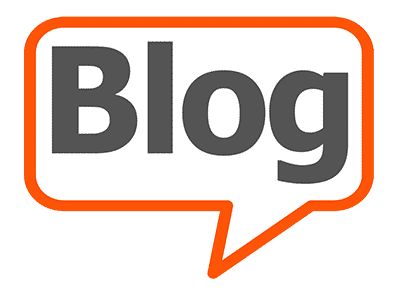 If the work runs late, however, it will be penalized. 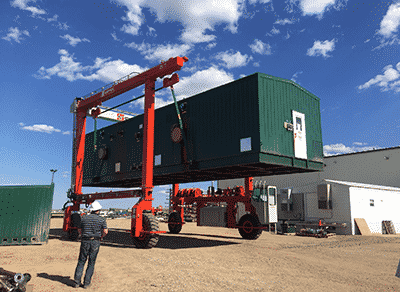 The delivery schedule for the new model was aggressive but was crucial to meeting deadlines. 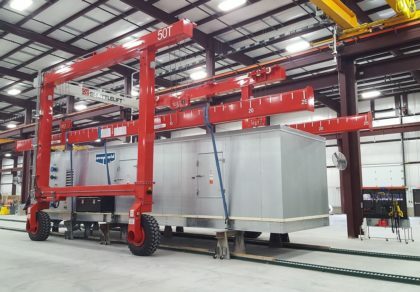 Shuttlelift even set up the new model at the factory and was still completed and delivered on time. 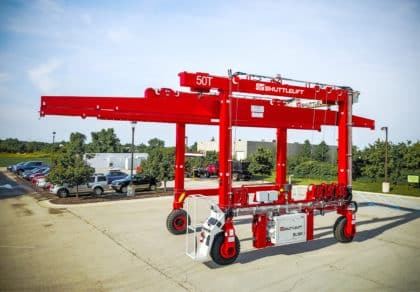 Shuttlelift’s double-beam, rubber-tired mobile gantry cranes were developed to meet the growing need for cost-effective lifting solutions among those who lift heavy, bulky items from production to transport. 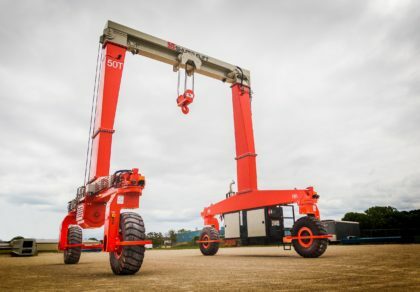 The cranes provide high-quality performance, efficiency and adaptable design, and they incorporate both advanced engineering and customer-driven design features. 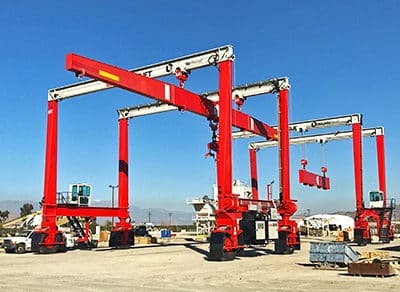 The DB series currently includes mobile gantry cranes that range from 30-ton to over 200-ton capacity with units delivered all around the world. 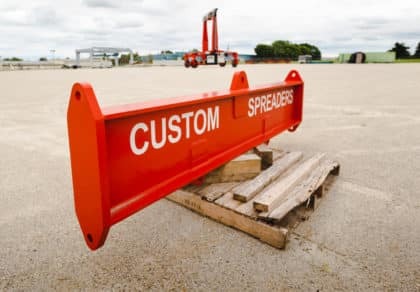 Each is engineered to be a customized lifting solution that can address a customer’s toughest material-handling challenges. 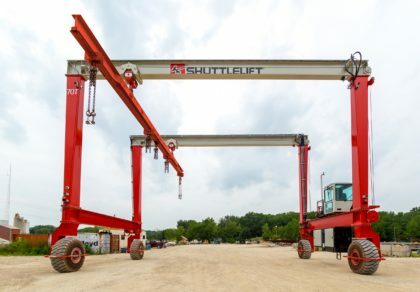 One key offering: Shuttlelift’s custom spreader assemblies, which provide the critical link between the gantry crane and the loads being lifted. 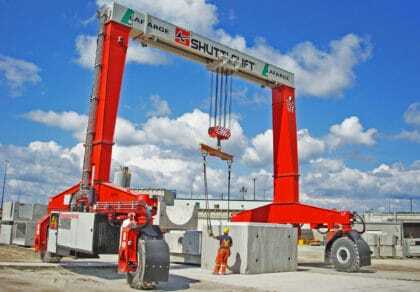 The Shuttlelift team reviews all possible lifting scenarios with the customer prior to manufacturing the new crane. 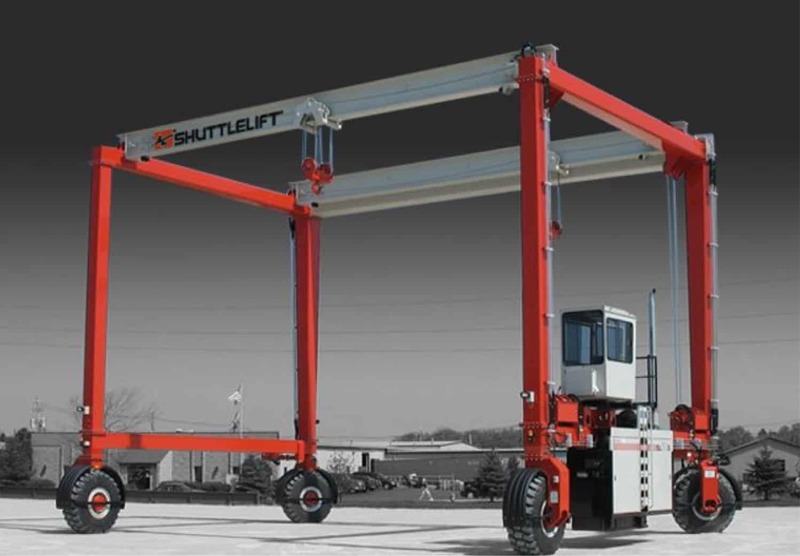 Shuttlelift designs the spreader assembly to have the versatility it needs to meet specific lifting needs and even multiple lifting needs. 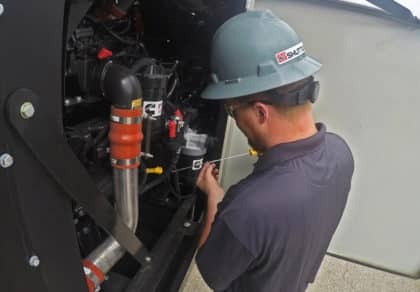 In this business, equipment versatility is key; the more you can do with one machine, the more efficient and profitable your operation will be. 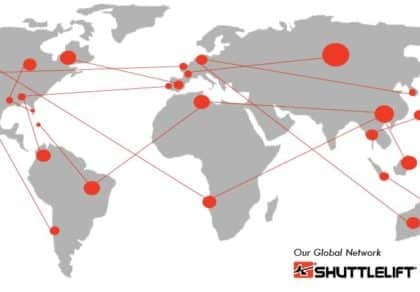 For more information about Shuttlelift and its full range of rubber-tired gantry cranes, e-mail the sales team at sales@shuttlelift.com or visit www.shuttlelift.com.